You do not have to report sales under $20K a year, right? Taxes, Record-keeping, and the Stuff You Don’t WANT to Talk About But MUST! Author and owner of five blogs, Carol Topp, will be giving a presentation on Blogs for Writers: Tips and Tricks at the West Chester Library(Ohio) Writer’s Group on Wednesday, August 10, 2011 at 7:00 p.m. 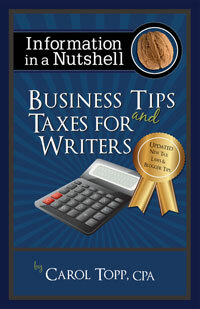 The Sisters in Crime blog featured an interview with Carol Topp, CPA on Tax Tips for Writers. The writer must be two people—an artist and an entrepreneur. From Idea to Information Product to Profitable and Very Successful Business. If you have an idea, then you can go From Idea to Information Product to Profitable and Very Successful Business in only 4 short weeks! Yes, YOU! Even if you do not have a website or even one customer yet! 29 great articles on taxes and finances for freelance workers.